With thanks to Red Adept Publishing and Melissa for the copy of the novel! My review is as always, non-bias and fair. Paranormal books have always been a hit with me, from demons to witches, ghosts to vampires, I love a good Fantasy novel. This all stitches together with Ever Near's enthralling premise and introduction. I couldn't wait to get started on this. Sixteen-year-old Jade Irving can't ignore the spirits that seem to cascade around Nantucket Island, after all; it is haunted. After moving into an enormous and older house with her new family, Jade hopes that the ghosts she can see will hopefully stop jumping out at her, appearing whenever she wants them the least. She hopes that maybe this time she can start over and things will be different, but life's course for her isn't quite serving up what she wished for. After Jade, her Mom and soon Stepfather, including his sons, move into the house, a new spirit takes a liking to Jade. Lacey, takes a shining to Jade, unlike most of the others Jade has encountered before. Lacey is a damaged soul with a huge backstory, who's life ended abruptly when she killed herself. She thinks of Jade as a sort-of daughter, but haunting her is starting to make Jade think that things will never change and she'll never have normality. Jade can't seem to understand why this ghost is unique, in particular, either. When she decides to finally confide in someone, her soon to-be stepbrother; Charlie, the journey and plot thickens to extremes and challenges Jade never thought that she'd reach. Suddenly, she's uncertain what's real...and what may not be. And if she can rid herself of the spirit, will her life ever return to the normality it was before...and is their romance in the cards for her? Melissa detailed a story-world so vivid that it seemed realistic and believable. The characters were each drawn a face in my mind that carried me through the novel with deep personalities and characteristics that I could believe. I loved the POV of Jade, and found her to be such a great main character, one that I empathised with and could sort-of understand, as much as a reader can, delving into the world. Jade's story was unique, haunting and perplex, and will be an ever-favourite of mine. I haven't read many ghost-based paranormal novels, but of all that I have so far, Melissa's is reigning at the top of Ghostly novels. 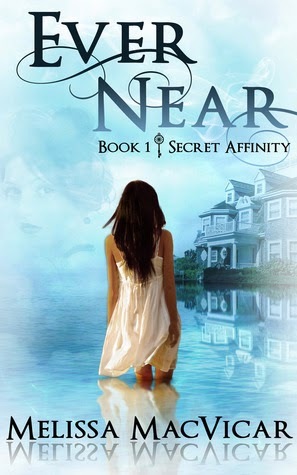 Have you read "Ever Near"?